Starting 23 November 2017, Singapore's LCC, Scoot will start its maiden flight to Palembang, capital city of South Sumatra from Singapore. The route will be operated four times weekly on Tuesdays, Thursdays, Saturdays and Sundays using A320 aircraft, said Chief Commercial Officer of Scoot, Vinod Kannan in Jakarta last October. Palembang on the wide Musi River offers exciting shopping for arts and crafts, delicious local food and many attractions. Next year, Palembang together with Jakarta will co-host the prestigious Asian Games 2018. Also this 23rd November, in response to rising demand, Scoot will increase its flights to Bali to 3 times daily, flying between Singapore - Denpasar, as well as increase its flights to 6 times weekly between Singapore and Surabaya, capital of East Java province. As LCC, the airline aims at young millennials who are looking for new adventures and new destinations at budget rates, said Vinod. From Singapore, flight TR250 to Palembang will take off from Changi airport on Tuesdays and Sundays at 15.00 hrs local time and arrive at Palembang's Sultan Mahmud Badaruddin II airport at 15.10 hrs. West Indonesia Time (there is a time difference of one hour between Singapore and WIT). While on Thursdays the plane will depart Changi airport at 10.30, arriving Palembang at 10.40hrs. both local times. And on Saturdays, leave Singapore at 11.05, arriving Palembang at 11.15. local time. Palembang was once the seat of the mighty Srivijaya Kingdom that reigned supreme from the 9th to the 13th century, also ruling over the seas up the Malacca Strait. It was the center of Buddhist learning, and many Buddhist monks from China used to come and study the religion in Srivijaya before proceeding to India. In the 15th century, Chinese Admiral Zheng He (here better known as Cheng Ho) came to Palembang. Today a mosque constructed in Chinese architecture is built here in commemoration of the historic visit of Cheng Ho. Unfortunately, not much of the great Srivijaya kingdom is left here, although its heritage can still be detected in the fine gold and silver songket sarong woven textiles, its lacquer-ware, and the opulent costumes worn by dancers. As an age-old trade hub, Palembang has a very cosmopolitan ambiance. 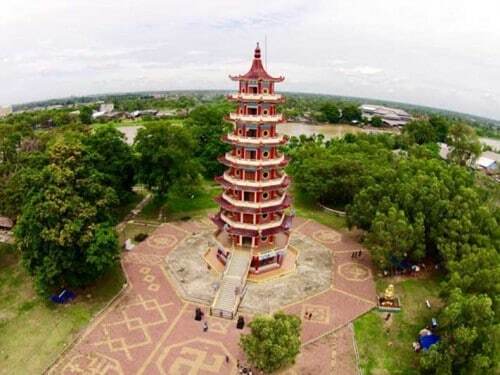 In the midst of the confluence where the Komering river joins the Musi river is the Kamaro Island where stands a huge Chinese pagoda. Chinese descendants from all parts of Indonesia as well as from Malaysia, Thailand and Singapore annually throng to the island to celebrate Cap Goh Meh here, marking the end of the Chinese New Year. In food, Palembang is best known for its "Pempek", which are large chunks of fish and meat balls wrapped in dough, boiled and eaten with a delicious hot, sweet and sour sauce.